The Holy Disciple Philemon and his spouse Apphia lived in the city of Colossa in Phrygia. Upon receiving Baptism from the holy Apostle Paul, they converted their house into an house of prayer, where all the Colossian believers in Christ gathered together and made Divine services. They devoted themselves to the service of the sick and downcast. The Disciple Philemon was made bishop of the city of Gaza and he preached the Word of God throughout all Phrygia. The holy Apostle Paul did not cease being his guide, and directed to him his Epistle filled with love, and in which he sends blessings “to Philemon our friend and co-worker, and Apphia our beloved sister, and Archippus our co‑striver, and their household the church,” (Phil. 1: 1-3). Onesimus, about whom it speaks in the Epistle, a Disciple from among the Seventy, was a former servant of Philemon. During the persecution of Nero (54-68) Saints Philemon and Apphia, and likewise the holy Disciple Archippus (who also lived at Colossa), all received the crown of martyrdom. During the time of a pagan feast an enraged crowd rushed into the Christian church when Divine-services were being made. All fled in terror, and only Saints Philemon, Archippus, and Apphia remained. They seized hold of them and led them off to the city governor. The crowd like beasts beat up and stabbed at Saint Archippus with knives, and on the way to the court he died. Saints Philemon and Apphia were stoned to death by order of the governor. 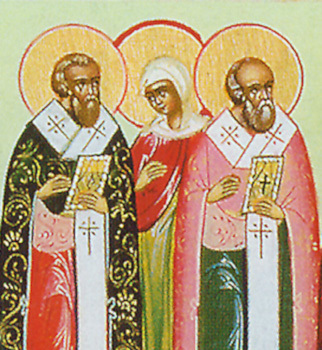 The memory of the holy Disciples Philemon and Archippus and Equal-to-the-Apostles Apphia is celebrated also on 19 February.